Day 1 - Welcome to Vancouver. Day 2 - Cruise the Gulf Islands to Victoria. Accommodation: DoubleTree by Hilton Hotel and Suites Victoria. 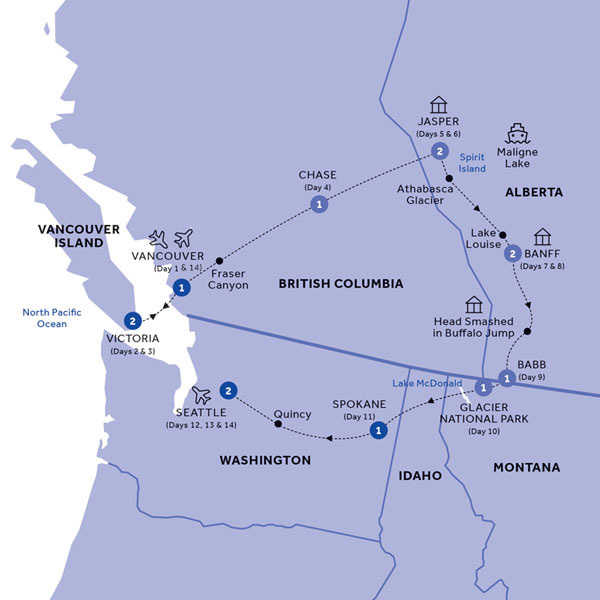 Day 4 - Victoria to Chase, British Columbia. Accommodation: Quaaout Lodge & Spa at Talking Rock Golf Resort, Chase. Day 5 - The Alpine Wonderland of Jasper National Park. Accommodation: Sawridge Inn and Conference Centre Jasper. Day 7 - Icefields, Glaciers and Lakes to Banff National Park. Accommodation: The Rimrock Resort, Banff. Day 9 - Quest for Buffalo on the way to Glacier National Park. Accommodation: Many Glacier Hotel, Glacier National Park, Babb. Day 10 - Going-to-the-Sun and the Glacier National Park. Accommodation: Lake McDonald Lodge, Glacier National Park. Day 11 - Lake Coeur d'Alene and Spokane. Accommodation: The Historic Davenport, Autograph Collection, Spokane. Day 12 - Wonderful Wines en route to Seattle. Accommodation: The Charter Hotel Seattle, Curio Collection by Hilton. Day 13 - The Soaring Sights of Seattle. Day 14 - Depart Seattle.